Our very own Momma Muse, Angela Butch, was honoured as one of Brooklyn’s Power Women in 2019! Described as “extraordinary” (QNS Media), Angela was nominated for the creation of ABCirque, The Muse, and for her illustrious career as an acrobat, aerialist and artist! The Muse is frequently featured in Time Out New York with various promotions and highlights! We were recently #2 on Time Out’s list of Top 50 Anniversary Deals - check it out! 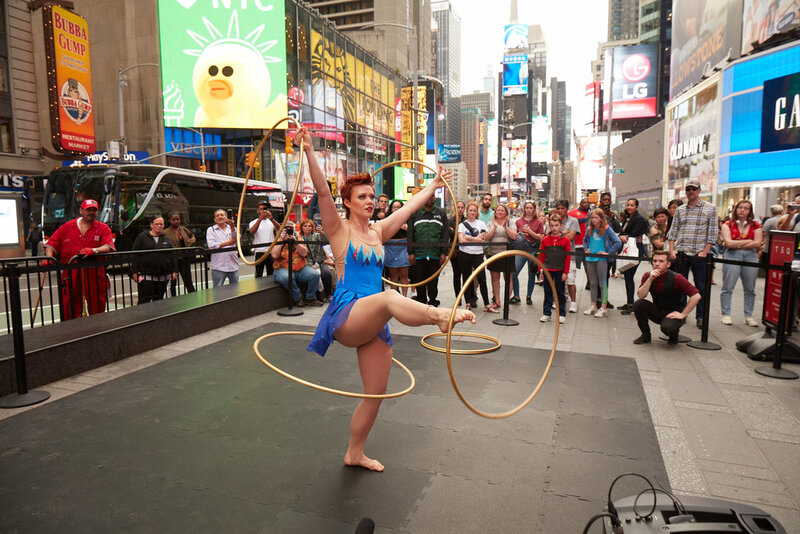 The Times Square Alliance says that ABCirque is a must-see this summer in Times Square! Don't forget to see them before summer ends! A Circus-Inspired Wedding in Brooklyn! The Cut covers the wedding of Muse founder, Angela Buccinni Butch and her husband Yoni Kallai. Hanging out has a whole new meaning at The Muse Brooklyn! The Muse was featured in Asiana Airlines' in-flight magazine as part of their "Destination Bushwick" coverage! "An immersive circus so thrilling, it will make you want to get up onto a trapeze"
TODAY’s Donna Farizan (aka Donnadorable) tries parkour obstacle course training at a facility in Brooklyn; a boxing-inspired group fitness class, and circus-inspired fitness training at The Muse Brooklyn! Our Dare To Try Challenge made it into a copy of amNewYork's "Things To Do" section on July 5th, 2017. Japan's Magazine "Pen Online" covers The Muse Brooklyn and what it's like to be a circus in Bushwick! The Muse Brooklyn and ABCirque join Rachel Ray for her Big Top Halloween Spectacular! Norte Maar presents the Brooklyn Performance Combine at The Muse Brooklyn in collaboration with ABCirque performers. A time-lapse video. Founder and Director of The Muse Brooklyn, Angela Butch discusses how she got her start, why she has the best job in the circus and what she needed to start it off. Harry tries bungee jumping for the first time with our world-class instructors! Check out the video to see the fun. The Muse Brooklyn's in-house company ABCirque performs for Business Insider LIVE on facebook! Check out the video . . . This week on BTRtv, Johanna Botta gets the story behind The Muse circus school in Brooklyn, and a lesson in aerial arts. The Muse gets a mention in The Awl article: From big tops to aerial silks—how is professional circus school changing the industry. Seen in NY shows The Muse - a premiere circus school and event facility that aims to foster a unique artist community in NYC.